Wiss 12'' Industrial Shear with bent handle and Knife Edge is ideal for cutting carpet, synthetic fibers & composite materials. Wiss industrial shears feature one blade ground to knife edge for faster, cleaner cutting, and precision ground blades for sharper cutting edges & longer blade life. The Wiss handle rings are designed to comfortably fit users hands, and the patented SET-EASY pivot adjustment easily and securely adjust to users preference. 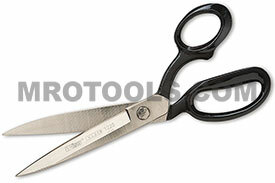 Wiss shears are made from hot dropped forged nickel plated blades. The W1226 Wiss 12'' Industrial Shear, Bent Handle w/ Knife Edge is one of thousands of quality tooling products available from MRO Tools. Please browse Wiss Scissors and Shears for tools similar to the W1226 Wiss 12'' Industrial Shear, Bent Handle w/ Knife Edge. W1226 Wiss 12'' Industrial Shear, Bent Handle w/ Knife Edge description summary: Wiss 12'' industrial shear with bent handle and knife edge is ideal for cutting carpet, synthetic fibers & composite materials. Quantity discounts may be available for the W1226 Wiss 12'' Industrial Shear, Bent Handle w/ Knife Edge. Please contact MRO Tools for details.